First time you run BigRingVR you will need to sign-in with your Google account. This is only needed to be done once, all future sign-ins will be handled automatically. 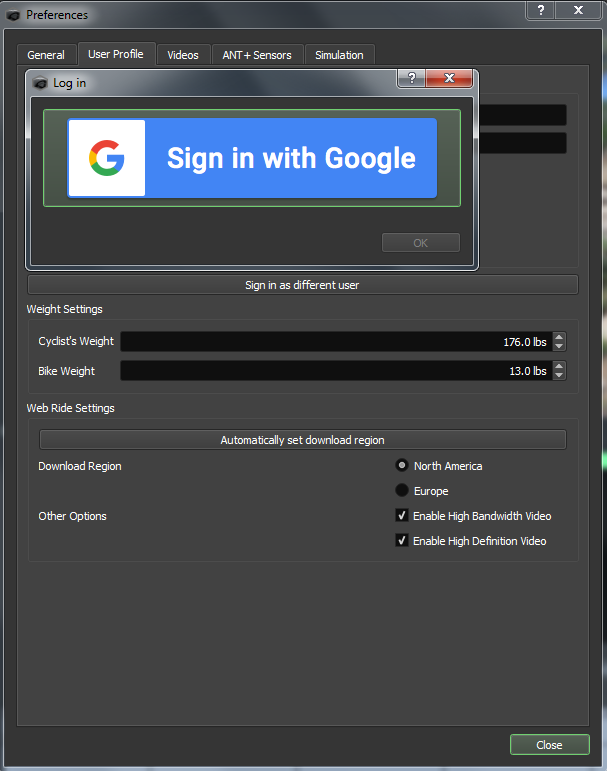 Make sure you create an online account on BigRingVR web site using Google sign-in first or you will get an error when trying to sign in from application. 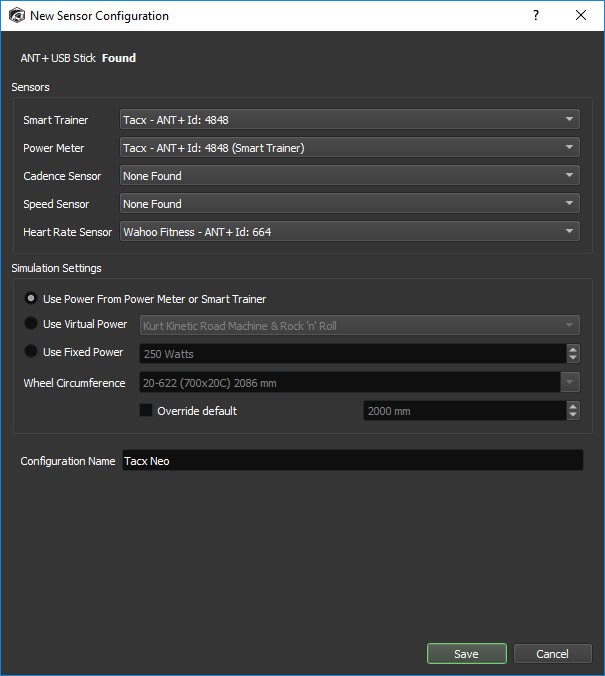 When pairing smart trainer we recommend searching specifically for Smart Trainer (search button next to ANT+ Smart Trainer) rather than doing full sensor search. Pick your trainer from the dropdown, your power will be calculated based on power curve data published by manufacturer. Let us know if your trainer is not listed so we can contact manufacturer for precise power curve data. While we work on this, you can use 'Generic Fluid' or 'Generic Magnetic' option. If you have ANT+ speed sensor, use this option and select 'Generic Fluid' or 'Generic Magnetic' as trainer. Give your configuration a name, for instance 'TACX Neo', BigRing will automatically seacrh for and pair your trainer or sensors. Press Save to store your configuration. You can set up multiple profiles with BigRing, for example you can have one profile that is linked to smart trainer and another profile that is linked to power meter. On the 'User Profile' tab you can set your weight and bike weight, as well as 'Web Ride' settings. Make sure to pick 'Download Region' that is closest to you. If you computer hardware meets recommended requirements then select 1080p for the best video quality. If you are not sure, give them a try and see if you PC can handle best setting. If your video stops or starts stuttering during the ride, it is better to use 720p option. Another (and better) option is to run a test to automatically determine optimal video quality setting ('Determine Web ride settings' button). It will test both Internet connection speed and GPU performance and will set the best options. These setting only apply to smart trainers. Speed calculation is not affected by these settings, only brake force applied by Smart Trainer. Those are very powerful settings to enhance your riding experience, keep them at max values (+/-25%) for the real terrain experience. If you want to do some intervals then you might want to set up 'Maximum uphill' at 4-5%, this way you won't need to shift gears when grades change and concentrate on your interval power instead. Video speed is still going to be calculated based on the power you produce, so it is not going to affect realism of the ride. Triathletes might find this feature very helpful as it opens a lot of steep climbs for training. Also great for recovery rides. If you are living and training at elevation, but want to correct your power output to sea level, you can adjust "elevation power correction" percent setting. 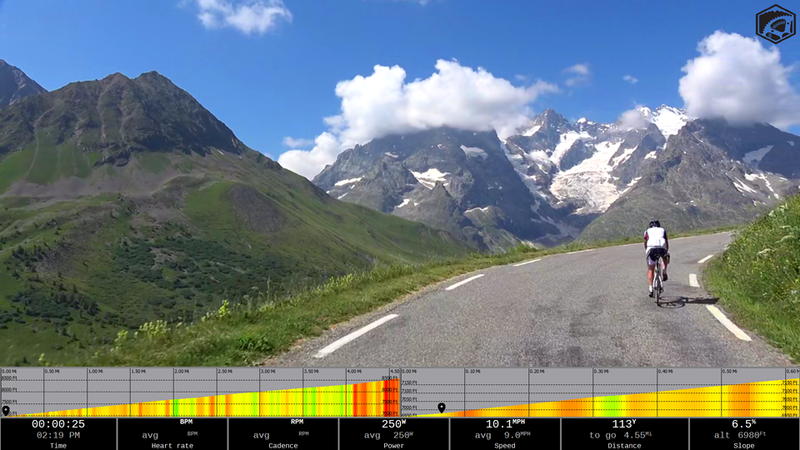 This creates fair level playing field for athletes doing virtual ride on elevation compared to athletes at sea level. For example, if athlete rides on elevation of (2100 meters or 7000 feet), suggested "elevation power correction" setting should be 9% (see chart in the link) - so, if athlete generates 250w, the speed will be calculated based on 272w (250w x 1.09). Power will still be displayed and saved as 250w, only speed is affected. We will also mark rides with "elevation correction" by an asterisk on BR Leaderboard. More information on FTP relation to altitude can be found on excellent post by Joe Friel. You can link to your Strava account, so when the ride is saved it will be automatically uploaded to Strava. If you know the name of the ride, enter it in the filter textbox in the left top corner. You don't need to enter exact name, 'Alp' will find 'Alpe d'Huez' and any other rides that match your search criteria. To make it easier to find rides, you can filter rides by Country, Elevation Gain, Diffictulty (FIETS) and Estimated Ride Time. Rides can also by sorted by Ride Name, Difficulty, Estimated Ride time, Elevation Gain, Rating and Popularity. 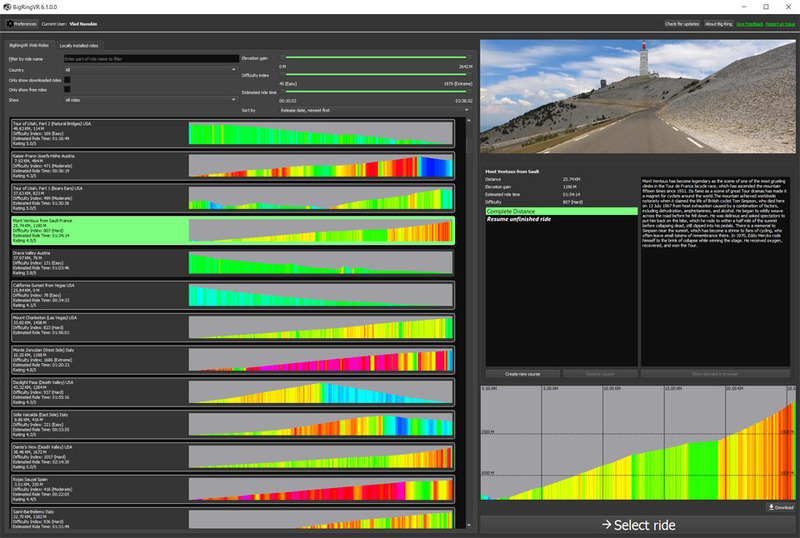 Pick a ride in the left panel, review ride profile in right panel, click 'Select Ride'. If you only want to ride part of the course, you can use 'Create New Course' button to customize and save start and finish of the ride. If you have good Internet connection (2mbps+), there is no need to download the ride, simply click 'Select Ride' button. We strongly recommend to try live streaming vs downloading, that will give you many more options when choosing a ride. If your internet connection is not fast enough and you are getting 'download buffer low' messages during live stream, then you should try 'Download Video' option. Click 'Download Video' button, wait for download to finish, click 'Select Ride' to proceed to the next screen. Once video is downloaded, 'Download Video' button becomes 'Delete Video' button. Please use this button to delete video once you finished the ride and ready to download a new one. During trial you can download 1 ride at a time, if you decide to subscribe download option is increased to 20. To race against your previous efforts or other riders, pick them from Activities list. Every time you save an activity for this ride, it will be put into Activities list. You can select up to five activities to compete against. If you want to be able to race against other riders, please make sure to check 'Enable Activity Sharing' in Preferences/User profile (default setting) - if this option is not checked, you will only see your efforts, if any. Click Start to ride. On this screen you can also choose a workout (see below) or Coach option. Coach functionality is designed to help you with pacing of the ride, you can set your Coach at specific power level. During the ride you will see your Coach as a marker on profile and in the competitor grid, just stay with the Coach to hit your power level for the ride. You can increase or decrease Coach power during the ride, see shortcuts below. 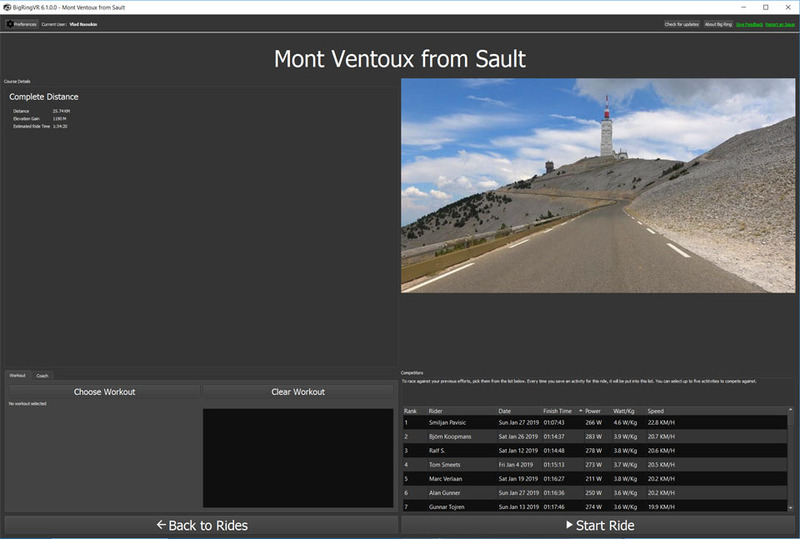 During the ride you can use keyboard shortcuts to enhance your riding experience. To end the ride press Esc button, you will have an option to save TCX file of your ride so it can be uploaded to your favorite sports web site, location of the file is configured in General tab. If you linked to your Strava account, then your ride will be automatically uploaded to Strava. There is also an option to rate the ride and add it to favorites, this will provide our riding community ability to find the best rides as well as provide you recommendations for other rides you might like. Workouts are currently supported for Smart trainers only in ERG mode. After you selected a ride, click 'Choose Workout' button to choose an ERG mode workout. Workouts are provided by BigRingVR and can also be imported from .ZWO, .ERG and .MRC files - to add workouts placing them in 'Documents\Big-Ring\Workouts' folder. To get more workouts or create your own custom workouts, please visit Zwofactory. Custom user training plans can be found here. During workout you can increase/decrease target power by 2% by using UP/DOWN keys, to skip interval press TAB.